THE FOLLOWING TERMS AND CONDITIONS OF USE AGREEMENT (hereinafter "Terms") governs your use of our web site (hereinafter "web site"). It is vitally important that you read the Terms carefully as your use of the web site will automatically constitute your agreement to be legally bound by the terms and conditions set out herein. These Terms also govern your use or purchase of the products/services provided through or in connection with the web site (hereinafter "services"). Each time you use our services, you acknowledge that you have read these Terms and agree to be legally bound by them. If you do not agree to be bound by these Terms, you may not use the web site(s) or the services provided by The Company through its web site(s). This website is owned by Online Packaging Shop, a trading name of Acopia Group Limited (hereinafter “The Company”) , a company registered in England and Wales (company number 09150714), whose registered office is at 2/4 Ash Lane, Rustington, Littlehampton, West Sussex BN16 3BZ. Our VAT registration number is GB284755616. "Company web site" shall mean all web sites on which The Company provides products and/or services. Individuals: These terms of sale apply to all goods and services supplied by Online Packaging Shop via http://www.onlinepackagingshop.co.uk. The website is governed by the following terms and conditions; they do not affect your statutory rights. We have taken care to describe and show items as accurately as possible. Despite this, slight variations in items may occur. We provide you with product information on http://www.onlinepackagingshop.co.uk. If there is anything which you do not understand, or if you wish to obtain further information, please contact our customer services team at sales@onlinepackagingshop.co.uk. Product images are for illustrative purposes only. Although we have made every effort to display colours accurately, we cannot guarantee that your computer’s display of the colours accurately reflects the colour of the products. Products supplied to you may vary slightly from those images. We make every effort to ensure that the pricing displayed on our website is correct. However, if an error in the pricing of a product is found we reserve the right either to cancel your order or to contact you to arrange payment of any extra sum due or to refund any over-payment made by you (as applicable). We reserve the right to alter all product pricing without notice. All prices are subject to VAT (where applicable) at the current rates. We reserve the right to express prices exclusive of VAT, but we shall show VAT separately and include it in the total price. Where we charge separately for packing, carriage and insurance and other relevant charges, the appropriate rates are set out in our specified pricing structure shown elsewhere on the website. Any order placed by you for goods advertised on our website is an offer by you to purchase the goods selected in your order. No contract exists between you and us for the sale of any goods until we have received your prepaid order and accepted it (which we may do at our discretion). Our acceptance of an order takes place when we despatch the order or send you confirmation by email even if your payment has been processed immediately. Where we do not accept your order but have processed your payment, we will credit the full amount back to the same debit, credit or Paypal account you used to make payment as soon as possible, but in any event within 14 days of your order. We will not be obliged to pay any additional amount as compensation for disappointment. Payment can be made by any of the options advertised on our website. Payment is made at the time of ordering and before delivery. If payment fails your order will be cancelled. There will be no delivery until cleared funds have been received. Payment online: It is our top priority to ensure that customers' transaction data is kept secure at all times which is why we use Sage Pay as our Payment Services Provider (PSP) for payments made using credit or debit cards. Sage Pay is audited annually under the Payment Card Industry Data Security Standards (PCI DSS) and is a fully approved Level 1 payment services provider, which is the highest level of compliance. They are also active members of the PCI Security Standards Council (SSC) that defines card industry global regulation. Sage Pay secure server software encrypts all your payment card details. The process scrambles all the information, allowing no unauthorised third party to intercept the data. Your browser will confirm that you are shopping in a secure environment by showing either a locked padlock icon or an image of a padlock next to the payment details in the relevant area of the website. We also accept payments made via PayPal. To ensure that your credit, debit or charge card is not being used without your consent, Sage Pay & PayPal will validate name, address and other personal information supplied by you during the order process against appropriate third party databases. Your legal right to cancel a contract starts from the date of the dispatch confirmation. If the products have already been delivered to you, you have a period of 14 (fourteen) calender days in which you may cancel, starting from the day after the day you receive the products. To cancel a contract, please contact us in writing to tell us by sending an e-mail to sales@onlinepackagingshop.co.uk or by sending a letter to Online Packaging Shop, 2/4 Ash Lane, Rustington, Littlehampton, West Sussex. BN16 3BZ. You may wish to keep a copy of your cancellation notification for your own records. If you send us your cancellation notice by e-mail or by post, then your cancellation is effective from the date you sent us the e-mail or posted the letter to us. You will receive a full refund of the price you paid for the products and delivery costs for faulty or damaged goods. All other returns are at the customer’s own expense and only the value of goods returned in the original packaging in good, clean, saleable condition will be credited. The original outbound carriage charge will also be refunded. For your protection, where you are returning an item to us, we recommend that you use a recorded-delivery service. If we do not receive the item(s) you wish to return for credit back from you, we may arrange for collection of the item(s) from your nominated address at your cost. You will be responsible for the costs of collection in the event that our specialist courier service collects any item from you to return to us. We will process the refund due to you as soon as possible and, in any case, within 14 calendar days of the day on which you gave us notice of cancellation. We refund you on the credit card or debit card or PayPal account used by you to pay. 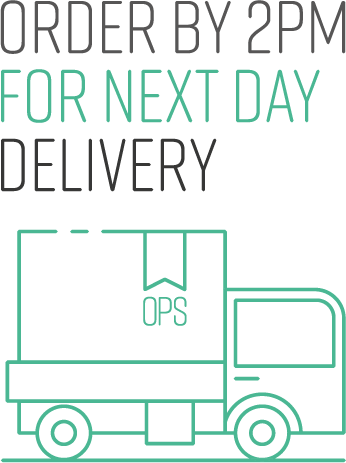 Subject to the item(s) you order being in stock and available for despatch we will deliver goods ordered by you as soon as possible to the address you give us for delivery, but in any event within 2-3 days of your order. However we reserve the right not to make deliveries outside the United Kingdom unless our ordering form provides that facility. If an item ordered by you is out of stock we will contact you by e-mail to inform you of the delay and agree a course of action. Upon receipt of your order you will be asked to sign for the goods received in good condition. If the package(s) does not appear to be in good condition then please refuse the delivery. If you are unable to check the contents of your delivery at the point of delivery then please sign for the parcel(s) as "UNCHECKED". Failure to do so may affect any warranty claims that you make thereafter. However, in all cases it is your responsibility to check the number of parcels you have actually received and are signing for and to mark the carrier’s paperwork accordingly as neither we nor the carrier will accept responsibility for any parcels later claimed to be missing. If you do not receive goods ordered by you within 2-3 days of the date on which you ordered them, we shall have no liability to you unless you notify us in writing at our contact address of the problem within 7 days from the date on which you ordered the goods. Consumers: If you refuse the delivery of your order for reasons under the Distance Selling regulations or you fail to take delivery because you have cancelled your contract under the Distance Selling Regulations, Online Packaging Shop will refund or re-credit you within 14 days for any sum that has been paid by you or debited from your credit card for the goods. By exercising your right to cancel you are required to return the goods to Online Packaging Shop. If you fail to return the goods to Online Packaging Shop we reserve the right to deduct any costs incurred in retrieving the goods from you. (b) sell the Products at the best readily obtainable price and either:– (i) where you have not already paid for the Products, charge you for any shortfall below the price you agreed to pay for the Products; OR (ii) where you have already paid for the Products, account to you (after deducting all reasonable storage and selling expenses) for any proceeds received. Goods dispatched to countries outside of the EU may be liable to Import Duty, Tax or VAT. When ordering from us you are agreeing to pay any such Duties which may be imposed by your country's government. You have the right to cancel your contract with Online Packaging Shop at any time up to 14 calender days after you receive the goods, in line with The Distance Selling Regulations. To cancel your contract in this time frame you must notify us in writing, either by post or by email at sales@onlinepackagingshop.co.uk. You will be responsible for returning the goods to Online Packaging Shop at your own cost unless the goods are faulty or mis-described. Upon receipt of the returned goods You will be credited within 14 calender days of notifying Online Packaging Shop of the cancellation. We will give you a full refund of the amount paid or an exchange credit as required, less (if for any reason these costs have not been paid by you) the costs of delivery to us. We will not issue refunds for any items lost or stolen in transit to us or goods sold "for food use" which have been opened except where a fault in manufacture could only have been discovered after the package had been opened. You have the right to cancel the contract at any time up to 14 calender days after you receive the Products by notifying us at sales@onlinepackagingshop.co.uk or in writing. If you cancel the contract after the Products have been delivered to you, you must return the Products to us at the address shown at your own cost and risk. If you cancel the contract before the Products have been delivered to you and then you receive the Products after cancellation you must not unpack them from their packaging but must immediately send them back to us. In any event you must return the Products to us within 14 calender days of notifying us of cancellation under this clause, or if later, of receiving them. If you do not we shall charge you a sum not exceeding the direct costs of recovering the Products. Until you return the Products to us you must keep them in your possession and take reasonable steps to ensure they are not damaged. Provided that we receive the Products within the specified period in the same condition they were in when delivered to you then we will refund you for the Products in question within 14 calender days of the receipt by us of the Products. You cannot return goods sold "for food use" which have been opened except where a fault in manufacture could only have been discovered after the package had been opened. If you are eligible for a refund, we will refund you back to the payment method you used when you originally paid for your order. Please note: It is your responsibility to notify us of any changes to your card details i.e. you no longer have that account. Refunds can take up to 14 calender days to process. On occasion, a product or service offered by advertisers on The Company’s web site may not be available at the time or at the price listed. In such event, or in the event a product or service is listed at an incorrect price or with incorrect information due to typographical error, technology effort, error in the date or length of availability, or error in pricing or product or service information received from our advertisers or other User, The User agrees that The Company is not responsible for such errors or discrepancies and that The User’s only course of action is to contact the appropriate advertiser or other User. What User derives from use of Online Packaging Shop products/services/information depends upon The User’s commitment to, and effort in, applying the information. Online Packaging Shop does not represent, warrant or guarantee that The User will achieve any particular results in business as a result of purchasing and using Online Packaging Shop products/services/information. The User acknowledges that the success of The User’s business depends on The User’s skills, effort and commitment. PLEASE SEE OUR EARNINGS AND TESTIMONIAL DISCLAIMER ELSEWHERE ON THIS WEB SITE. Online Packaging Shop regularly sends out a newsletter and/or other informational emails (collectively referred to as "Newsletters") to all Users. In these Newsletters, we may inform you about new services, features or products. The User may choose to unsubscribe from the Newsletter at any time using the unsubscribe option at the bottom of our emails, or by writing to us at sales@onlinepackagingshop.co.uk or following the unsubscribe link contained in each of the emails. The Company web site contains copyrighted material, trademarks and other proprietary information, including, but not limited to, text, software, photos, video, graphics, music and sound and the entire content of the web site is copyrighted as a collective work under UK and International copyright laws. The Company owns a copyright in the selection, coordination, arrangement and enhancement of such content, as well as in the content original to it. You may not modify, publish, transmit, participate in the transfer or sale, create derivative works or in any way exploit, any of the content, in whole or in part. Except as otherwise expressly permitted under copyright law or these Terms, no copying, redistribution, retransmission, publication or commercial or non-commercial exploitation of downloaded material will be permitted without the express written permission of The Company and the copyright owner. Elements of the web site are protected by trade dress, trademark, unfair competition and other laws and may not be copied or imitated in whole or in part, by any means, including but not limited to, the use of framing or mirrors. In accordance with UK and International law, any notifications of claimed copyright infringement should be sent to us immediately. Such notification can be sent by email, to sales@onlinepackagingshop.co.uk or by letter to: Online Packaging Shop, 2/4 Ash Lane, Rustington, Littlehampton, West Sussex. BN16 3BZ. Use of this website http://www.onlinepackagingshop.co.uk, as described below, is prohibited. These descriptions are guidelines and are not intended to be exhaustive or all-inclusive. Illegal/Criminal Activity: The Company web site may not be used in connection with criminal or civil violations of state, federal, or international laws, regulations, or other government rules or requirements. Such violations include theft or infringement of copyrights, trademarks, trade secrets, or other types of intellectual property; fraud; forgery; theft or misappropriation of funds, credit cards, or personal information; and threats of physical harm or harassment. Security Violations: The Company web site may not be used in connection with attempts—whether successful or not—to violate the security of a network, service, or other system. Examples of prohibited activities include hacking, cracking into, monitoring, or using systems without authorisation; scanning ports; conducting denial of service attacks; and distributing viruses or other harmful software. Basic Security: User is responsible for maintaining the basic security of its computer system and to prevent its use by others in a manner that violates these Terms. Examples include: improperly securing a mail server so others can use it to distribute spam; improperly securing a FTP server so that it may be used by others to illegally distribute licensed software or media content. User is responsible for taking corrective actions on vulnerable or exploited systems to prevent continued abuse. Threats: The Company web site may not be used to transmit materials of a threatening nature, including but not limited to threats of death or physical harm, harassment, libel, and defamation. WARNING: ANY VIOLATION OF THESE POSTING RULES THAT INVOLVES CRIMINAL CONDUCT OF ANY KIND WILL BE REFERRED TO LAW ENFORCEMENT AUTHORITIES UPON NOTICE RECEIVED BY THE COMPANY. It is your responsibility to determine that your input into our site, including use of any chat room areas of our site, including your choice of your user name, conforms to the above conditions. If you notice any content which breaches these conditions, please notify us by email to webmaster@onlinepackagingshop.co.uk. c. Sending any unsolicited e-mail that could be expected, in The Company’s opinion, to provoke complaints. e. Sending bulk e-mail without identifying in the e-mail a clear and easy means to be excluded from receiving additional e-mail from the originator of the e-mail. NOTE: The inclusion of an opt-out clause does not necessarily legitimise sending unsolicited e-mail. g. Using The Company facilities to violate what could reasonably be considered a violation of another Internet Service Provider's (ISP) acceptable use policy and/or terms of service. The resale of The Company’s products and services is not permitted, unless expressly permitted by these Terms or in a separate written agreement. Violations of these Terms may result in immediate suspension or termination of your account and our services to you, immediate temporary or permanent filtering, blocked access or other action appropriate to the violation, as determined by The Company, in its sole discretion. A. When using our services, The User warrants and represents that all of the data provided by you is accurate and complete. The User shall report any modifications in the data to the The Company web site, immediately upon any changes occurring. B. The User shall not be allowed to have multiple accounts. You may only establish one (1) User account. If The Company determines that The User has established more than one (1) account, further use of our web site may be suspended or terminated, subject to the sole discretion of The Company. C. The User warrants and represents that they are of legal age (18 or older) to use our web site, at their time of use, or that they are a legal entity, created by operation of law. D. The User may download or print a single copy of any portion of the content solely for personal, non-commercial use, provided they do not remove any trademark, copyright or other notice from such content. E. The Company shall not be liable for The User’s interactions with any 3rd-parties, businesses and/or individuals found on The Company’s web site or through the services provided. This includes, but is not limited to, payment and delivery of services, and any other terms, conditions, warranties or representations associated with such dealings. These dealings are solely between The User and such 3rd-parties, businesses and/or individuals. The User understands and agrees that The Company is not responsible for any damage or loss incurred as a result of any such dealings. The Company is under no obligation to become involved in disputes between Users of our web site, or between Users on our web site and any 3rd-party. In the event of a dispute, The User agrees to indemnify The Company its officers, employees, agents and successors in rights, against claims, damages and demands of every kind, known or unknown, suspected or unsuspected, disclosed or undisclosed, arising out of or in any way related to such disputes and our service. Online Packaging Shop recognizes that any data provided by The User to us is extremely important and we shall, therefore, be particularly sensitive in handling such data. Users are advised that there are inherent security risks in transmitting data, such as emails, credit card or personal information, via the Internet, because it is impossible to safeguard completely against unauthorized access by 3rd-parties. Nevertheless, The Company shall do what is reasonable to safeguard your data, subject to this cautionary limitation. In particular, personal information will be transmitted via the Internet only if it does not infringe upon 3rd-party rights, unless the respective party has given prior consent in view of such security risks. Accordingly, The Company shall not be held liable for any damages incurred as a consequence of such security risks or for any related acts of omission on our part. When The User posts content or contributions to the Company web site, The User grants The Company a limited, revocable, nonexclusive and non-assignable right of use for the respective content or contribution that The Company is entitled to utilise for any purpose allowed by these Terms. In particular, The Company is entitled to use said content or contribution posted by The User for marketing or in any other way. The Company may use User content or contributions in any form, format, or medium of any kind now known or later developed. a. To request deletion of User content, The User must send an e-mail to Customer Services at webmaster@onlinepackagingshop.co.uk stating the e-mail address associated with the particular content you wish to delete, along with the words "Delete User Content" in the subject line. Please note that if The User subsequently places the same or similar content on the Company web site, this deletion notice will become null and void. B. The Company grants a right of use over all User -posted content or contributions to its web site(s) to other Users. Copying, downloading, disseminating, distributing and storing of the contents of the Company web site is, with the exception of the cache memory when searching for Company web pages, prohibited without The Company’s express written consent. C. All information, content, services and software displayed on, transmitted through or used in connection with the Company web site, with the exception of User content as defined herein, including for example, news articles, reviews, directories, guides, text, photographs, images, illustrations, audio clips, video, html, source and object code, trademarks, logos, and the like, as well as its selection and arrangement, is owned by The Company, except for those items that are copyrighted and/or owned by their respective businesses or individuals. E. Without limiting the generality of the previous paragraphs, The User authorises The Company to share User-posted content across all web sites, to include User content in a searchable format accessible by other Users of the Company web sites, now in use or later developed, to place advertisements in close proximity to such User content, and to use The User’s name, likeness and any other information in connection with The Company’s use of the material The User provides. F. Prohibited uses do not include any other use that The Company expressly authorises in writing. H. The Company does not guarantee the accuracy, integrity or quality of the posted content on our web site and The User may not rely on any of this posted content. Without limitation, The Company is not responsible for postings by Users in the User opinion, blog, message board, and forum or feedback sections of our web sites. The Company and its employees do not accept or consider unsolicited ideas, including ideas for new advertising campaigns, new promotions, new products or technologies, processes, materials, marketing plans or new product names. Please do not send us any original creative artwork, samples, demos or other works. The sole purpose of this policy is to avoid potential misunderstanding or disputes when The Company’s products or marketing strategies might seem similar to ideas submitted to us by others. We ask that you do not send your unsolicited ideas to The Company or any individual at The Company. If, despite our request that you not send us your ideas and materials, you still send them, please understand that The Company makes no assurances that your ideas and materials will be treated as confidential or proprietary. To register with http://www.onlinepackagingshop.co.uk you must be at least 18 years of age. User must complete the registration process by providing The Company with current, complete and accurate information as prompted by the applicable registration form. The User must also choose a password and a User name. We may deny access to any User, at any time, and for any reason. In addition, The Company may, at any time, transfer rights and obligations under these Terms to any current or future Company subsidiary or business unit, or any companies or divisions or any entity that acquires The Company or any of its assets. COMPANY WEB SITES AND ALL MATERIALS, INFORMATION, PRODUCTS AND SERVICES INCLUDED IN THE COMPANY WEB SITES, ARE PROVIDED "AS IS," WITH NO WARRANTIES EXPRESSED OR IMPLIED. THE COMPANY EXPRESSLY DISCLAIMS, TO THE FULLEST EXTENT PERMITTED BY LAW, ALL EXPRESS, IMPLIED AND STATUTORY WARRANTIES, INCLUDING, WITHOUT LIMITATION, THE WARRANTIES OF MERCHANTABILITY, FITNESS FOR A PARTICULAR PURPOSE AND NON-INFRINGEMENT OF PROPRIETARY RIGHTS. THE COMPANY DISCLAIMS ANY WARRANTIES REGARDING THE SECURITY, RELIABILITY, TIMELINESS AND PERFORMANCE OF THE COMPANY WEB SITES. THE COMPANY DISCLAIMS, ANY WARRANTIES FOR ANY INFORMATION OR ADVICE OBTAINED THROUGH THE COMPANY WEB SITES. THE COMPANY DISCLAIMS ANY WARRANTIES FOR SERVICES OR PRODUCTS RECEIVED THROUGH OR ADVERTISED ON THE COMPANY WEB SITES OR RECEIVED THROUGH ANY LINKS PROVIDED BY THE COMPANY WEB SITES AS WELL AS FOR ANY INFORMATION OR ADVICE RECEIVED THROUGH ANY LINKS OR ANY USER CONTRIBUTIONS PROVIDED TO THE COMPANY WEB SITES. The User acknowledges and agrees that it is virtually impossible to achieve continuous, uninterrupted availability of the Company or any other, web site. While we endeavour to ensure that this website is normally available 24 hours a day, we will not be liable if for any reason this website is unavailable at any time or for any period. Access to this website may be suspended temporarily and without notice in the case of system failure, maintenance or repair or for reasons beyond our control. If any provision of these Terms is, for any reason, invalid and/or unenforceable, as determined in an appropriate Court of proper jurisdiction, the remaining provisions shall continue to be valid and enforceable to the fullest extent permitted by law. You agree to replacement of an invalid and/or unenforceable provision with a valid and/or enforceable provision that most closely approximates the intent and economic effect of the invalid and/or unenforceable provision and shall be interpreted most favourably, when possible, to the benefit of The Company. Incident Reporting: Any complaints regarding violations of these Terms by a User should be directed to customer services at sales@onlinepackagingshop.co.uk. Where possible, include details that would assist The Company in investigating and resolving the complaint (i.e. expanded headers and a copy of the offending transmission). Complaints Procedure: We are very proud of our high standards of customer service however, in the event that we fail in meeting these standards, please do not hesitate to contact us at Online Packaging Shop, 2/4 Ash Lane, Rustington, Littlehampton, West Sussex. BN16 3BZ. These Terms represent the entire understanding between The User and The Company and supersedes any prior statements or representations. THE USER AGREES TO THE TERMS OF THIS ONLINE AGREEMENT, by using the web site, its services, sign up, posting, downloading and uploading content, and understands that it is entering into a binding and legal agreement with The Company. These Terms and Conditions were last updated, and became effective, on 27/07/2013.